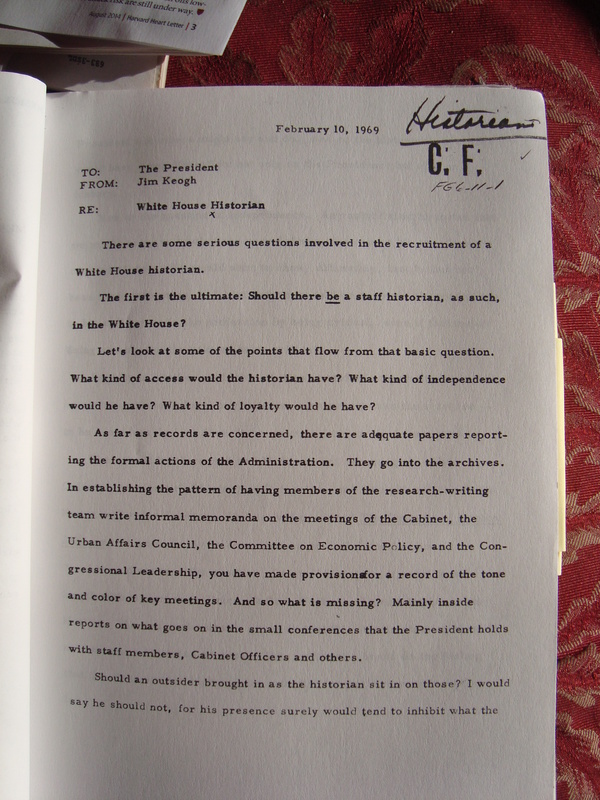 On Jan. 27, 1969, less than a week into the Nixon presidency, Nixon’s chief of staff H. R. Haldeman relayed the following request from President Nixon to White House aide and former Time magazine executive editor James Keogh: “The President is most anxious to bring in an official White House historian to make sure that we maintain on a current basis an accurate record of the work of this administration.” Nixon even had a person in mind for the position: Professor Ernest May, a historian at Harvard University who had served on the Lindsay transition task force. 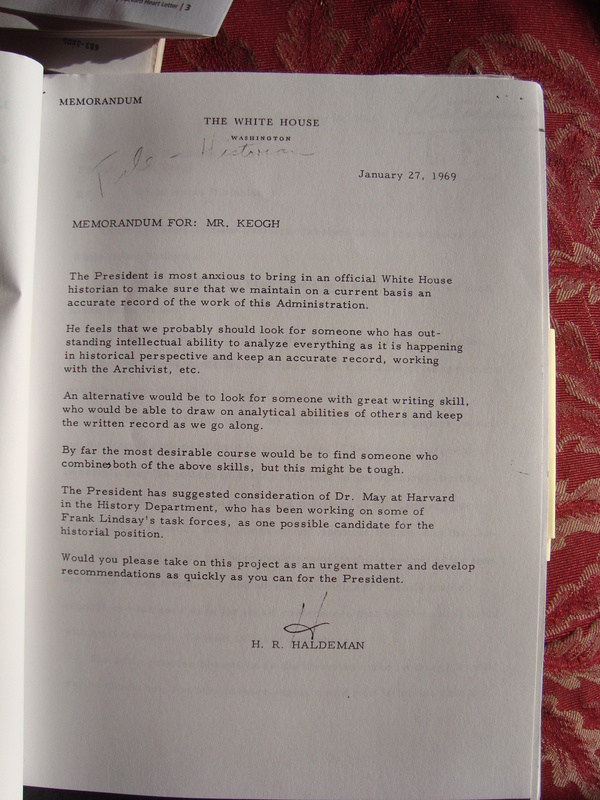 More generally, Nixon sought someone “who has outstanding intellectual ability to analyze everything as it is happening in historical perspective and keep an accurate record… .” Here is the full memo from Haldeman to Keogh. In addition to inhibiting conversation, Keogh warned that “any established historian that we might bring on would have very definite ideas about his own freedom of point of view.” That might mean a desire to prove “his credentials to his colleagues in the profession by being critical even if that meant doing so only for the sake of being critical.” Keogh also warned that “Loyalty is another problem” – someone who initially expressed support for the President might, over time and in reaction to events, change his views. We now know, of course, that Nixon did Keogh one better. In 1971, so as to provide a more accurate history of his administration’s proceedings, he had a secret taping system installed in the Oval Office, the Old Executive Office Building, the Cabinet Room and at Camp David. Conversations were recorded via this voice-activated system for more than two years, starting on February 16, 1971 through July 18, 1973. It was these tapes, particularly this so-called “smoking gun” tape dating from June 23, 1972, that provided clear proof that Nixon obstructed justice by trying to impede the investigation into the Watergate break in. When a unanimous Supreme Court ruled 8-0 that Nixon must hand over the tapes to an independent prosecutor, and the transcripts of the tapes were made public, Nixon lost any hope of surviving the Watergate scandal. Forty years ago today, he officially resigned the presidency. It is tempting, of course, to surmise that if only Nixon had appointed a court historian, he might not have also seen the need to install a taping system. But that is probably not the case. From the moment they take office, all presidents, and their immediate advisers, are aware that they are making history and they understandably want to insure an accurate record of the events in which they participate. But meeting notes can only go so far toward providing that record. For this reason Franklin Roosevelt, Kennedy and Johnson all secretly recorded some White House conversations. Kennedy did so despite the presence of Schlesinger, Jr., as his White House “court historian”. “From the very beginning,” Nixon writes in his memoirs, “I had decided that my administration would be the best chronicled in history.” Little did he know how prescient that statement was. No subsequent president has, to my knowledge, kept any recording system in their White House, and for good reason. And, with the advent of e-mail, even the paper documentary trail is a less reliable history of a president’s time in office (although there are safeguards in place that are intended to preserve electronic messages as part of an administration’s presidential records). Had Nixon been less conscious of the need to accurately record the events of presidency, he might have emulated his predecessors and utilized a manually-activated recording device. But he did not. For want of a switch, he lost the presidency.